Military lawyers assigned by the Pentagon to detainees, [prisoners], at Guantanamo Bay are planning to present a brief to the US Supreme Court tomorrow, criticising the fairness of the legal process. The brief says the detainees, [scapegoats and patsies for the Coalition of the Killing's resource war's in the Middle East], should have the right to a civilian appeal, after they are tried by military commission. At the moment, a military review panel will look at their cases and, [war criminal], President George W Bush has the final say. [Mr] David Hicks is one of two Australian detainees, [scapeoats], and could be one of the first to face trial. The brief does not question the United States' right to hold the detainees, [scapegoats], without charges, nor does it go into the rules of the military commission, which civilian lawyers have criticised. Previously, anonymous sources have said the Pentagon defence lawyers were unhappy with the legal process, [? ], but this is the first public confirmation of that. David Hicks' military counsel, Major Michael Mori, is one of the lawyers involved. A leading human rights group has denounced the United States Government for continuing to hold prisoners without charge two years after it set up the detention, [prison], camp at Guantanamo Bay in Cuba. The objective is to continue to inform the public; and maintain the issue alive. There will be information on both David and Mamdouh to hand out to the general public. There will also be two Season's Greetings cards for the public to sign which will be presented to Alexander Downer - as Parliament will be on recess by then, I will ask the Fair Go for David Group in South Australia to present these to Downer. 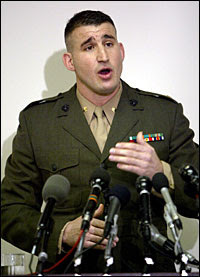 In a stinging rebuke of the Bush Government, a United States appeals court has ruled the US cannot imprison "enemy combatants," [scapegoats and patsy's for the Coaltion of the Killing's resource war's in the Middle East], captured in Afghanistan, [held], indefinitely at Guantanamo Bay and deny them access to lawyers. Adelaide lawyer Stephen Kenny says he hopes to meet with United States military captive David Hicks at Guantanamo Bay before Christmas. Red Cross warns resource wars in the Middle East are eroding human rights The head of the International Committee of the Red Cross (ICRC) has warned that the worldwide campaign against terrorism [the Coalition of the Killing's resource wars in the Middle East], must not be used to breach peoples right under international law. The lawyers for the two Australian men being held, [tortured in solitary confinement], at Guantanamo Bay have had different reactions to the, [war criminal], Federal Government's agreement with the, [war criminal], United States over procedures for any 'military trials'. FOREIGN prisoners, [scapegoats for the Coalition of the Killing's resource war's in the Middle East], held in Cuba, including Australians David Hicks and Mamdouh Habib, will never have played their legal card until they're freed! TAXPAYERS have forked out $185,000 for a documentary promoting the release of David Hicks - because the Coalition of the Killing used him as a scapegoat for their illegal and degrading resource war's in the Middle East. After a war waged by the U.S. military against Vietnam which took the lives of more than 3 million Vietnamese people and more than 58,000 GIs, the U.S. finally withdrew in 1975. It had suffered its first official major military defeat by a united people struggle led by the Vietnamese, along with a mass U.S. anti-war movement. The supporters of two Australian detainees [prisoners] being held [tortured] by the United States at Guantanamo Bay in Cuba say they draw no comfort from [war criminal], Prime Minister John Howard raising the men's plight with [war criminal], US President George W Bush. The Greens politicians refused to be ejected and attempted to deliver a letter and photograph to the president. But Kerry was literally dragged away and that behaviour in Parliament was worrying. The wife of an Australian man imprisoned at Guantanamo Bay has urged the Prime Minister to seek her husband's release when the United States President visits Australia this week. GUANTANAMO BAY, Cuba, Oct. 9 A senior official of the International Committee of the Red Cross said on Thursday that the holding of more than 600 detainees [prisoners] here was unacceptable because they were being held for open-ended terms without proper legal process. The Federal Labor leader, Simon Crean, has tried to head off planned protests by some opposition MPs when the US President addresses Parliament next week. Australian investigative journalist John Pilger says he has evidence the war against Iraq was based on a lie which could cost George W Bush and Tony Blair their jobs and bring Prime Minister John Howard down with them. Illegal and degrading war crimes: Society on the New World Order (OWN)! While Australia and the US are very distinctive societies war criminal, Prime Minister John Howard and war criminal, President George Bush share core values.